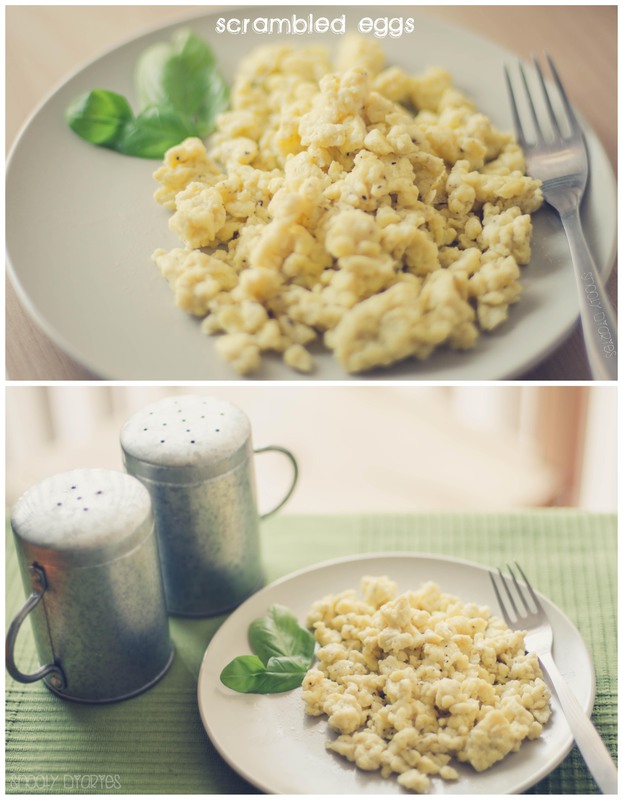 Scrambled Eggs is an easy favorite for many as it’s so simple and quick to make. Though I don’t eat eggs, I make this quite often for my husband and he absolutely LOVES it. My recipe is slightly different from the original as I use olive oil instead of butter which makes it more healthy. 1. Crack the eggs in a bowl and beat them till they turn pale yellow. Add the milk, salt and pepper and whisk them with an electric beater for 5-7 mins till it turns frothy. 2. Heat olive oil in a pan on medium heat and add the mixture to it. Do not stir. Let the bottom of the egg set . 3. With a spatula, start folding the eggs over themselves while gently shaking the pan with the other hand to make sure the remaining liquid gets cooked. 4. When there is no more liquid left, remove the pan from the heat instantly. Garnish with fresh basils and serve hot. You can replace olive oil with butter and also add a 1tbsp cheddar cheese to make the egg more rich and creamy. I will post an indian variant of this recipe soon. This entry was posted in FOOD, Recipes and tagged breakfast, english breakfast, minute meal, Olive oil, quick meal, scrambled eggs. Bookmark the permalink.